Celebrating the life of Raymond D. Paul Sr.
Obituary for Raymond D. Paul Sr.
Raymond D. Paul, Sr., 85, passed away peacefully, surrounded by his family, on March 30, 2019 at home. Raymond was born in Appleton on April 14, 1933 to parents Raymond H. Paul and Helen Esancy Paul. Raymond grew up in Appleton and Belfast. He was actively involved in 4-H, which fostered his love for farm life and agricultural fairs. Raymond joined Belfast Masonic Lodge in 1968 and was Master in 1973. 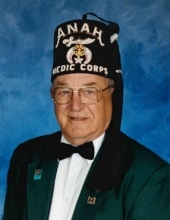 He was a longtime member of Anah Shrine in Bangor, Waldo County and Midcoast. He served on many units, as well as the ROJ. Raymond was a past president of the Belfast Curling Club. Raymond along with his wife, Delma, loved watching and attending sporting events. They also enjoyed camping, curling, attending Shrine events and county fairs (especially Fryeburg) where he made many lifelong friends. Raymond was predeceased by his wife, Delma, sister Edna Blood, brother-in-law Melvin Shute and sister-in-law Minnie Payson. He is survived by daughters, Debra Paul, Cindy Herbig and husband Les, Connie Pooler and husband Keith, son, Ray Paul and wife Karen. Grand-children, Monica Damon, Erica Sprague and partner Ryan, Troy Sprague, Erin Herbig and husband Joe Baiungo, Kevin Herbig and wife Gabrielle, Gavin Cross, Cody Cross and fiancé Megan, Brian Cross and partner Isabel, and Stephen Paul and fiance’ Stephanie. Great–grand-children, Lauren and Emma Damon, Hailey Levangie, Owen, Finn, and Theo Herbig, Anna Baiungo and Charles Herbig-Baiungo. Raymond is also survived by brother-in-laws Stanley Blood, Darrell Payson and wife Ann, Burt Payson and wife Fran, Carold Payson and wife Peggy, Lauren Payson and Dan Perry. Sister-in-laws Janice Shute, Maureen Larrabee, Cherylene Labbe and husband Paul, Cheryl Larrabee and husband John, and many nieces, nephews, cousins and special friends. A celebration of Raymond’s life will be held Saturday April 13, 2019, at the Waldo County Shrine Club between 3:00 – 6:00 p.m.
Those who wish can make contributions in Raymond’s memory to the Waldo County Shrine, P.O. Box 285, Belfast, ME 04915. To send flowers or a remembrance gift to the family of Raymond D. Paul Sr., please visit our Tribute Store. "Email Address" would like to share the life celebration of Raymond D. Paul Sr.. Click on the "link" to go to share a favorite memory or leave a condolence message for the family.